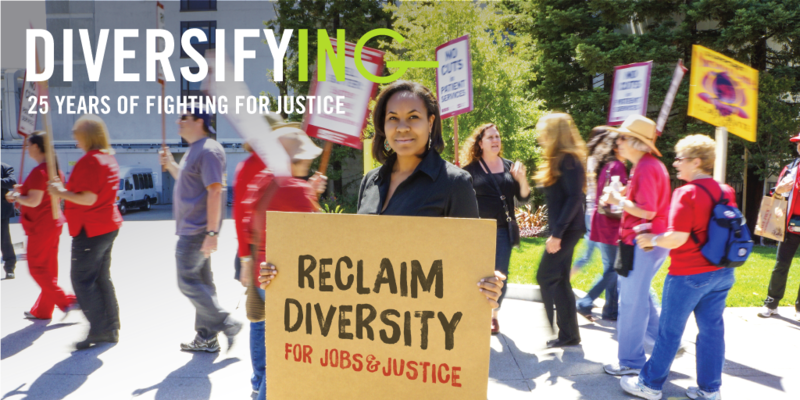 I have the exciting job of leading Greenlining’s Diversity and Inclusion initiative. We seek to reframe the narrative on diversity to focus on justice and its role in ending the racial wealth gap once and for all. In this year of Greenlining’s 25 anniversary, it’s important to take stock of where we’ve been to better inform where we want to go. As the organization evolved over time we took those values of diversity and inclusion and operationalized them into policies to make meaningful impact for our communities and close the racial wealth gap. We started with supplier diversity in energy and telecommunications. The California Public Utilities Commission’s General Order 156 mandates that the state’s big utilities (think PG&E, Verizon, etc.) must disclose their level of contracting with minority-,women-, disabled veteran-, and LGBT-owned companies. It sounds simple, but we quickly found out that what gets measured gets done. In 1986 women- and minority-owned companies received just $2.6 million in contracts from these huge companies; in 2016, thanks to the transparency required by GO 156, that number rose to $8.8 billion, without a single quota or set-aside. That represents a massive boost for diverse-owned businesses, enabling them to expand, hire more workers, and help close the racial wealth gap. In 2012 we built off the success of GO 156 and sponsored AB 53, legislation which created similar public reporting requirements for insurance companies in California. Four years later that expanded into the Multistate Insurance Diversity Survey, including California, the District of Columbia, Minnesota, New York, Oregon, and Washington (combined these states represent 65 percent of the national insurance market). In 2016, insurance companies in these states spent $7.9 billion with diverse suppliers. We’ve also advanced supplier diversity through partnership. In 2012 we started working with the newly established federal Offices of Minority and Women Inclusion at 20 of the nation’s financial regulatory agencies to diversify the financial industry. In 2014 we partnered with California’s largest depository banks to release the nation’s first report that compared banks against one another on their level of contracting with diverse businesses. In parallel with supplier diversity, Greenlining also advances workforce diversity policies. Our Health Equity team has a long history making the case for diverse health workforces and pipeline programs that bring young people of color into health careers. We’ve also turned our attention to Silicon Valley and last year shook up the tech world with a No Uber Oakland campaign, with specific demands on employment practices, when the company announced a move to downtown Oakland (it eventually pulled out). Corporate America remains a critical front in the struggle for civil rights, and we continue to hold corporations’ feet to the fire in a variety of fields: Last month we released a corporate board diversity report examining California’s 59 most influential companies. It hasn’t all been sunshine and rainbows. In 2007, after our research showed that major foundations gave only a tiny percentage of grants to people of color-led nonprofits, Greenlining touched the third rail of the nonprofit world and sponsored a bill to mandate diversity reporting from California’s largest foundations. AB 624 would have required foundations with assets over $250 million to report on their governance and domestic grantmaking. Notice that I wrote would have. We received tremendous pushback, including a hit in which the author called us “shakedown artists”– a badge I wear with honor– and eventually we came to an agreement with 10 of the most powerful foundations to sign a multimillion dollar pledge, and the major commitments were indeed fulfilled. Greenlining has always viewed economic justice as a critical component of civil rights. Over the past 25 years it became clear that our diversity and inclusion work served as the connective thread, and in 2016 we decided to make diversity and inclusion a formal initiative. This allows us to de-silo, share best practices across industries, and make the implicit explicit. We sometimes forget, but the racial wealth gap and access to jobs always formed a key part of the civil rights struggle, dating back to Martin Luther King’s 1963 March on Washington for Jobs and Freedom. Our recently-launched Diversity, Equity and Inclusion Framework marks the beginning of the next phase of our efforts to make economic justice a reality for all, and turn the racial wealth gap into a distant memory. Danielle Beavers is Greenlining’s Diversity and Inclusion Director. Follow her on Twitter.